The Prime Minister, speaking at Rabacca on Sunday, March 27, during his Unity Labour Partyâs (ULP) celebration of ten years in office, said that he is willing to work with the Council, with whom he met two weeks ago, for the love of the country. In a four-point statement issued last week, the Council called for an immediate process of reconciliation between the ULP and opposition New Democratic Party (NDP). They also called for the Representation of the People Amendment Bill 2011 and all protests to be put on hold. An offer was also made by the Council to facilitate an independent analysis of the Bill and that they (the Council) play a mediating role in the process. Responding to the Councilâs request for the hold on the Bill, Dr. Gonsalves indicated to the supporters that the Bill is in fact on hold and that any request for additional time by the Council would be accommodated. ââ¦The Bill is already on hold; the next meeting is May 5th for the Select Committeeâ¦. You have until May 5th. If they say to me that they want another two weeks beyond that, thatâs fine for me. Dr. Gonsalves said that he is confident that when the time comes, the Bill will be passed. With respect to reconciliation, Dr. Gonsalves said that he informed the Council that the opposition NDP needs to reconcile themselves to the fact that they lost the General Elections, which took place on December 13th last year. 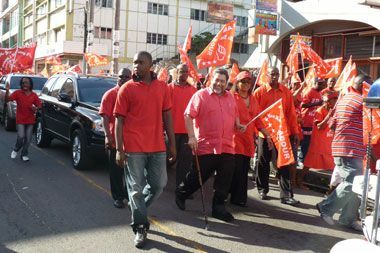 The Arnhim Eustace-led NDP organised a series of protests during the Parliamentary sittings this year, objecting to a number of issues, including a proposed amendment to the Representation of the People Act. âIf you want to believe you win it and mek yourself a fool every other week by bringing 200 people in town, that doesnât do anything against me or the country,â Gonsalves said. The Prime Minister opened his address with what may be seen as a step towards reconciliation, by calling on his supporters to love their neighbors as they love themselves, but at the same time, he said it does not mean loving their sins. âBecause if you hate, it will eat you inside; and those to whom you show goodness turn upon you, it would be hot coals upon their heads. St. Vincent and the Grenadines is too small for the hatred and the division that some are devoted to engendering. St. Vincent and the Grenadines is too poor a country for us to waste so much resources in fighting and pulling down one another.